My two oldest boys (age 7 and 5) swim on our neighborhood swim team in the months of May and June. 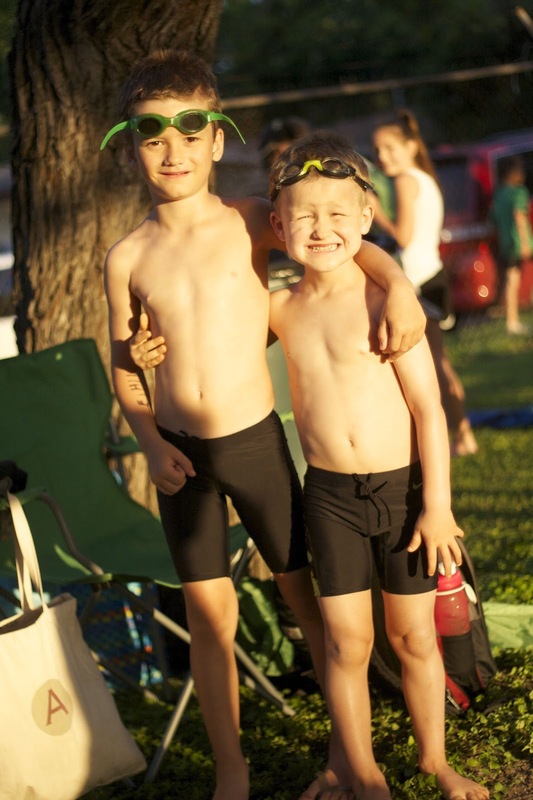 It is fun way to be involved in our immediate community and the boys love swimming daily. They are becoming better swimmers, keeping fit, and sleeping well at night - all good things! - I have observed that parents do not appreciate other parents telling them what is "healthy" and what is not. There are many differing opinions and food practices in people's homes. Better to focus on what everyone can agree on at a baseline: Soda and Candy are unhealthy and we can do better - everyone knows this. You will probably find that most parents will be extremely supportive. - I only made bottled water and coffee (swim meets get started at 6am) available to drink. Bottled water had an optional powder drink packet that could be added to the water to flavor it (i.e. lemonade or fruit punch). Each team parent is required to donate items to be sold each year. Last year, it was a case of soda of their choice. This year, it was a case of water. Simple switch! - I recruited a couple of other businesses to support the effort. My local Trader Joe's donated a case of bananas and a gift card to buy snack packs of nuts and trail mix and fresh fruit. Another local business bought breakfast tacos to sell in the early morning hours. Tacos made with real eggs, meat, and fresh tortillas. That's the ONLY breakfast option we offered - no giant muffins or donuts. You know what? They sold like hotcakes! We also offered a small selection of bagels with cream cheese, honey, or peanut butter. Honestly, they didn't sell well. But they were at least an alternative to sugary breakfast junk. - I went to Costco and found plenty of snack options that were just plain better than candy. Annie's organic snack packs of crackers, granola bars, peanut butter crackers, and baked chips were easy to swap for candy and other nutrient-bare items. - THE MOST SUCCESSFUL part of the concessions centered around two items: Fresh Cut Watermelon and Home Baked Goods. I recruited other parent volunteers to cut watermelon, bag it in sandwich bags, and bring it with them to the meets. I also recruited mommies to bake cookies out of real stuff (butter! sugar! and no ingredients no one can pronounce!) to sell. These items were the most successful sellers and the most profitable. - The last thing I did was to create an appealing food environment. This comes from my hospitality background - I firmly believe that if food looks appetizing, people are excited about eating it! We arranged the fresh items in baskets on tables (instead of boxes from the big box store) with table clothes and a bistro-style chalkboard for our menu. Small changes that required some work from me - I bought the wood, cut and painted it myself - but made big impact. 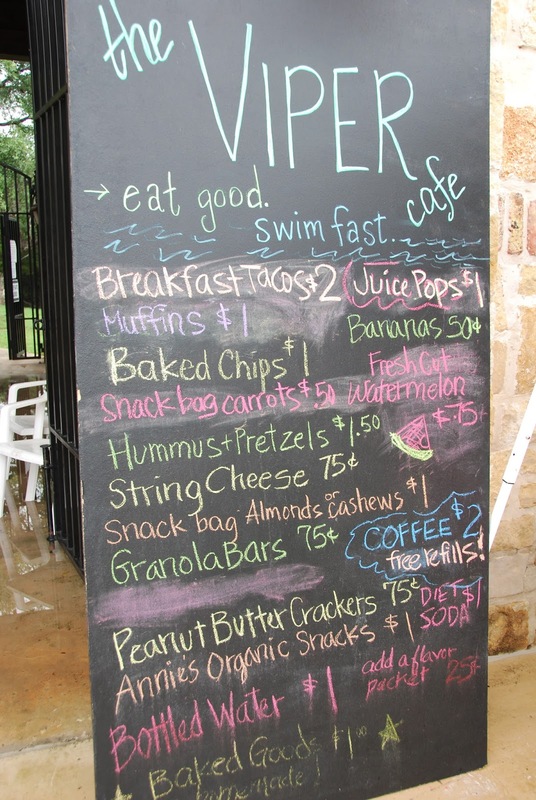 Now, some may ask two important questions: Can a "healthy" concession stand make money? and Is all that work really worth it? 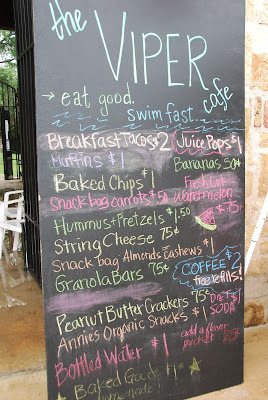 The typical profit from a summer of Swim Team concessions has ranged from $200-900 each year. This year we made close to $1600. So, YES. It can make money. Donations from parents of fresh cut watermelon, baked goods, and local businesses helped. But I also think that many parents supported the concept and bought more of the food they were happy to see their kids eating, instead of avoiding the concession stand like the Plague because their kid begged over and over for a candy bar. The last thing to touch on is, YES, this is worth it. It is worth it to me as a mom to spend my own time and money trying to create a better food environment for my kids and others in my community. It really is not that difficult. It does take work on your part, but the results are truly worth it. Maybe an opportunity like this doesn't exist in your community, but perhaps you can consider how something similar might be a chance for you to do something. We simply must stop waiting around for other people to do the something we need to be doing as parents to help drastically reduce the amount of junk food in our kids' environment. Kids+Food: What can you DO? Kids+Food: It's Time to Face It.